I have a common name. “Susan” ranked big in the decade when I was born. The surname “Burke” came to England and Ireland with the Normans and soon became common. “Sue” is also the largest, most complete, and best preserved Tyrannosaurus rex ever discovered, now on display at the Field Museum in Chicago. I am Sue, fear me. “Burke” is a verb, too: 1. to murder in such a way as to leave no marks on the body, usually by suffocation; 2. to get rid of, silence, or suppress. That meaning comes from William Burke, who, with his partner William Hare sold bodies to a medical school for anatomical dissection. To get those bodies, they killed 16 people, usually by suffocation, before they were discovered. 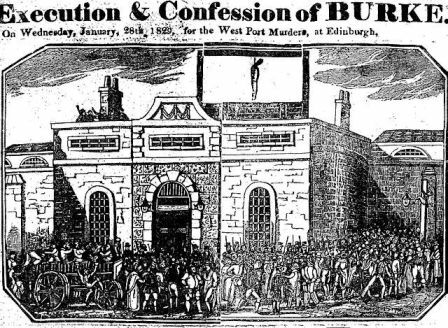 Hare turned state’s evidence, and Burke was hanged in 1829. I don’t believe we’re related, which is a relief.